غلامیان, هادی, طارمیان, اصغر, پورطهماسی, کامبیز. (1396). بررسی میکروسکوپی اثرات اصلاح سطح چوب با فرایند سل‌ژل بر کیفیت پوشش‌دهی آن با پوشش‌های آلکیدی و پلی‌اورتان. مجله صنایع چوب و کاغذ ایران, 8(4), 509-520. هادی غلامیان; اصغر طارمیان; کامبیز پورطهماسی. "بررسی میکروسکوپی اثرات اصلاح سطح چوب با فرایند سل‌ژل بر کیفیت پوشش‌دهی آن با پوشش‌های آلکیدی و پلی‌اورتان". مجله صنایع چوب و کاغذ ایران, 8, 4, 1396, 509-520. غلامیان, هادی, طارمیان, اصغر, پورطهماسی, کامبیز. (1396). 'بررسی میکروسکوپی اثرات اصلاح سطح چوب با فرایند سل‌ژل بر کیفیت پوشش‌دهی آن با پوشش‌های آلکیدی و پلی‌اورتان', مجله صنایع چوب و کاغذ ایران, 8(4), pp. 509-520. غلامیان, هادی, طارمیان, اصغر, پورطهماسی, کامبیز. بررسی میکروسکوپی اثرات اصلاح سطح چوب با فرایند سل‌ژل بر کیفیت پوشش‌دهی آن با پوشش‌های آلکیدی و پلی‌اورتان. مجله صنایع چوب و کاغذ ایران, 1396; 8(4): 509-520. در این تحقیق با استفاده از مطالعات میکروسکوپی اثرات اصلاح سطح چوب صنوبر با فرایند سل‌ژل بر کیفیت پوشش‌دهی آن با پوشش های آلکیدی و پلی‌اورتان برای کاربرد در فضای باز بررسی شد. برای این منظور از پوشش سل‌ژل تترا اتوکسی سیلان استفاده شد و پس از خشک شدن آن، پوشش‌های آلکیدی و پلی‌اورتان با دستگاه فیلم‌کش اعمال شد. کیفیت پوشش‌دهی با استفاده از میکروسکوپ‌های فلوئورسنت، لیزری (CLSM)، الکترونی SEM) (EDX- مورد بررسی قرار گرفت. نتایج مطالعات EDX حاکی از حضور گروه‌های سیلانی در نمونه اصلاح شده با فرایند سل‌ژل بود. نتایج مطالعات میکروسکوپی فلوئورسنت نشان داد که بر خلاف پوشش‌های آلکیدی و پلی‌اورتان که فقط حفرات سلولی را پر کرده بودند، پوشش‌ سل‌ژل بیشتر در دیوار‌های سلولی نفوذ کرده است. مطالعات میکروسکوپ لیزری نشان داد که در اثر آمایش سطح چوب با فرایند سل‌ژل از میزان زبری پوشش‌های آلکیدی و پلی‌اورتان در اثر هوازدگی کاسته می‌شود. DeMeijer, M., 2001. Review on the durability of exterior wood coatings with reduced VOC-content. Progress in Organic Coatings, 43: 217–225. Allen, NS., Edge, M. and Ortega, A., 2004. Degradation and stabilisation of polymers and coatings: nano versus pigmentary titania particles. Polymer Degradation and Stability, 85(3): 927–946. Lowry, M. S., Hubble, D. R., Wressell, A. L., Vratsanos, M. S., Pepe, F. R. and Hegedus C. R., 2008. Assessment of UV-permeability in nano-ZnO filled coatings via high throughput experimentation. Journal of Coatings Technology and Research, 5(2): 233–239. Gholamiyan, H., Tarmian, A., Doost Hosseini, K. and Azadfallah, M., 2011. The effect of nano particles and common furniture paints on water resistance behavior of poplar wood (P.nigra). 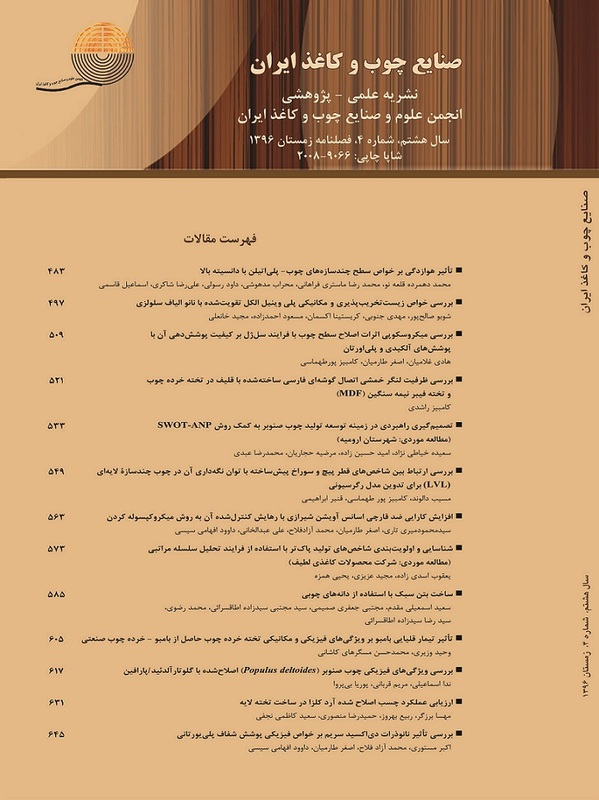 Iranian Scientific Association of Wood & Paper Industries, 2(1): 16–26. (In Persian). Williams, R., Winandy, J. and Feist, C., 1987. Paint adhesion to weathered wood. Journal of Coatings Technology, 59 (749): 43– 49. Kord, B., zare, H. and Hosseinzadeh, A., 2016. Investigation on the effect of mixed rapeseed stalk residues with wood particles, and mixing of melamine and urea formaldehyde resin on properties of manufactured particleboard. Iranian Journal of wood and paper industries, 7(2):167-178. (In Persian). Unger, B., Bucker, M., Reinsch, S. and Hubert, T., 2012. Chemical aspects of wood modification by sol–gel-derived silica. Wood Science and Technology, 47: 83–104. Tshabalala, M. A., Kingshott, P., VanLandingham, M. R. and Plackett, D., 2003a. Surface chemistry and moisture sorption properties of wood coated with multifunctional alkoxysilanes by sol-gel process. Journal of applied polymer science, 88: 2828–2841. Christine Ritschkoff, A., Jamsa, S., mahlberg, R., Mannila, J., Nikkola, J., wang, S. and Peltonen, J., 2010. Advanced wood products with nanoengineered surfaces. International Conference on Nanotechnology for the Forest Products Industry. Sept. 27-29, Otaniemi, Espoo, Finland, p169-171. Wang, SH., Liu, C., Liu, G., Zhang, M., Li, J. and Wang, C., 2011. Fabrication of superhydrophobic wood surface by a sol–gel process. Applied Surface Science, 258: 806– 810. Tshabalala, M. A. and Gangstad, J. E., 2003b. Accelerated weathering of wood surfaces coated with multifunctional alkoxysilanes by sol-gel deposition. Journal of Coatings Technology, 75(943): 37–43. Nikkola, J., Mahlberg, R., Mannila, J. and Jamsa, S., 2010. Effect of curing process on simulated antisoiling properties of sol–gel coating on pine sapwood. Journal of Coatings Technology and Research, 7 (4): 441–448. Jayme, G. and Harders-Steinhäuser, M., 1970a. Microscopy of wood and paper fibres. Microscopic staining procedures, In Freund, H., Handbook of microscopy in technology, Vol. V Microscopy of wood and paper, Part 2 Microscopy in technology of wood converting and wood degradation. Umschau-Verlag, Frankfurt/Main, 151 p.
 Werthmann, B., 1993a. Microscopic testing of chemical pulps, mechanical pulps, and paper. Microscopic staining methods. Springer Berlin Heidelberg, 66-99. Enomae, T. and Yamaguchi, N., 2006. Influence of coating properties on paper-to-paper friction of coated paper. Journal of Wood Science, 52: 509–513. Tshabalala, M. and Sung, L.p., 2007. Wood surface modification by in-situ sol-gel deposition of hybrid inorganic-organic thin films. Journal of Coatings Technology and Research, 4 (4): 483–490. Dill-Langer, G., Lütze, S. and Aicher, S., 2004. Microfracture in wood monitored by confocal laser scanning microscopy. Wood Science and Technology, 36(6): 487–499. Singh, A. P. and Dawson, B. S. W., 2004. Confocal m croscope ─ a valuable tool for examining wood-coating interface. Journal of Coatings Technology and Research, 1(3): 235–237. Tomsic, B., mončč, B., rel, B., Černe, L., Tavčer, P. F., Zorko, M., Jerman, I., Vlčn k, A. and Kovač, J., 2008. Sol-gel coating of cellulose fibres with antimicrobial and repellent properties. Journal of Sol-gel Science and Technology, 47: 44–57. Jamali, A. and Evans, P.D., 2008. In: Coatability of thermal-oil-treated post-MPB, FPInnovations-Forintek Division, Canada. 210 p.
 Rasmussen, J.S., Barsberg, S. and Felby, C., 2014. Complex between lignin and a Ti-based coupling agent. Holzforschung, 68(5): 541–548. Donath, S., Militz, H. and Mai, C., 2004. Wood modification with alkoxysilanes. Wood science and technology, 38(7): 555–566. Tingaut, P., Weigenand, O., Mai, C., Militz, H. and Sèbe, G., 2006. Chemical reaction of alkoxysilane molecules in wood modified with silanol groups. Holzforschung, 60: 271– 277. Donath, S., Militz, H. and Mai, C., 2006. Creating water-repellent effects on wood by treatment with silanes. Holzforschung, 60: 40–46. Fernando, de., Moura, L. and Hernandez, R.E., 2006. Evaluation of varnish coating performance for three surfacing methods on sugar maple wood. Forest Products Journal, 56: 11–12. Bulcke, J.V.D., Acker, J.V., Saveyn, H. and Stevens, M., 2007. Modeling film formation and degradation of semi-transparent exterior wood coatings. Progress in Organic Coatings, 58:1–12.